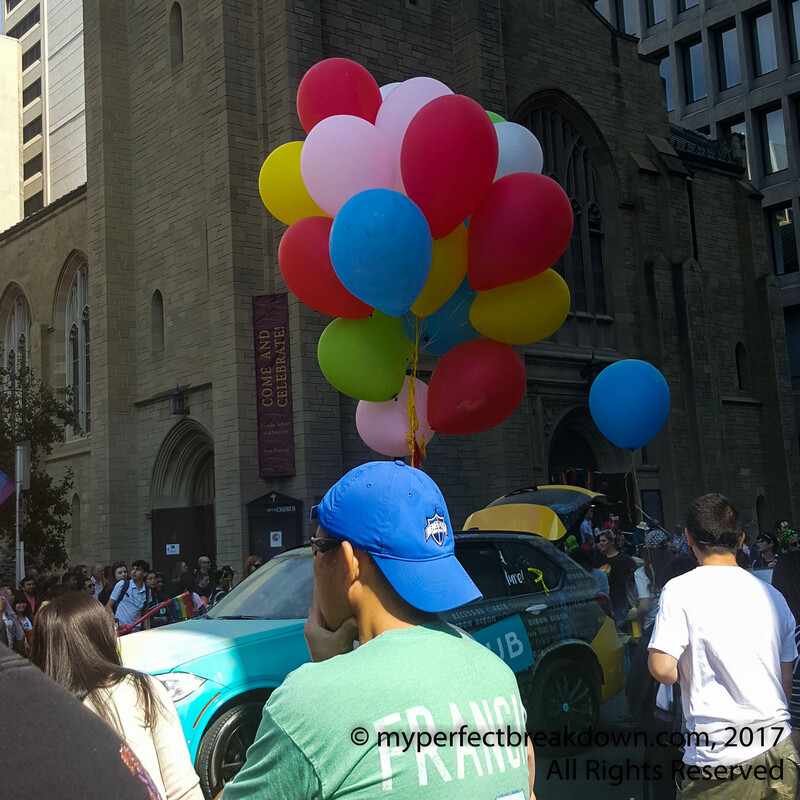 We went to the Pride Parade in our city recently. (In the crazy of the head/neck injury and resulting toddler proofing of our house, I almost forgot to mention it). Mr. MPB and I have never been to a pride parade before, but we thought it seemed like a great free activity that would expose Little MPB to an event which promotes love, diversity and equality – all things I very strongly support. But I have to admit, the most disheartening part of the parade was the counter protest we witnessed (I suspect maybe this is a regular thing at pride parades?). A religious group made a point to show up to chant not very nice things while holding not very nice signs. And all I thought was, this is definitely part of why I choose not to participate in organized religion at this point in my life. And, while I may not take my son to church (he will get exposure to religion through his grandparents, and he can make his own choice about religion in the future), I will always teach my son about love, kindness, compassion and acceptance of everyone. When I read those first sentences, I thought you were in the ambulance during the pride parade (it helps to read slowly, Katy!). I’m pretty open about my faith and belief in God and the church and all of that. It hurts my heart that people of faith choose to express their beliefs in this way. I don’t share that attitude, by the way, in case you were wondering. I don’t believe Jesus would want us to hate on anyone, much less a minority who has been forgotten, abused, and outcasted. Having been a part of the pregnancy loss community has given me glimpses of being part of a minority group, and that has only opened my heart to compassion even more. Not to mention the fact that my best friend from middle school is gay. Plus, a high school friend and a friend from my youth group. I hope that the encouragement and love were heard over the counter-protesters. Love God. Love Others. Everything else is in God’s realm of judgment, not mine. Much love, friend. I updated the first sentence, because when I re-read it, I read it exactly how you did! Ops! 🙂 Also, thank you for sharing your perspective. I definitely know not all religious people support the hateful things we heard at the parade. Although you didn’t ask, I thought I’d share a bit about my religious believes. I joke that if anything I’m a very confused Christian. I was brought up attending church, a very liberal church (the United Church of Canada) that accepted all people and I believe was the first church in Canada to openly accept LGBTQ people. After my mom and sister died I continually was told things like “God has another plan for them” or “God needed them” – I just couldn’t wrap my mind around the concept that God made someone drive through a stop sign because he needed my mom and sister while destroying my family. Then, my Dad re-married and we started going to my step-families incredibly conservative church (Lutheran). I continually asked my Dad about how these two churches could be preaching such different thing – love vs. hate, compassion vs. obedience, heaven vs hell, etc. I fully acknowledge I was at a very conflicted time in my life, but my Dad’s response always stuck with me – “It doesn’t matter what church we go to, i’s the same god.” For me, I was like, hold on, so my compassionate, loving god also hates people and is going to condemn us all to hell?!?! How can this be? Needless to say, to this day I haven’t been able to wrap my mind around organized religion. I believe I still lead my life in a manner consistent with the teaching of the United Church. I believe I’m spiritual, but probably not in the traditional Christian way, I desperately would like to believe in an afterlife but I’m not really sure what my believes are on the afterlife, but I still have so much confusion within me that at this point I’ve chosen not to attend organized church but to lead my life in way that respects those of all faiths. I have no idea if this makes any sense to anyone outside of my mind. But, I thought I’d share it anyways. As always, lots of love to you my friend. The God that I know loves EVERYONE and wants us to love everyone. We are not the judge. of anyone! It is our job to love each other how He has loved us. It really is so sad that some people spend their lives hating others and do it in the name of religion. I have been fortunate enough to not see this when I have gone to the Pride Parade in my state. Which by the way has been a complete blast! I was talking to DH about it a month or so ago and how bad I want to go and take Baby Bach. This year had too much going on, but I will be taking him in the future. Baby Bach has gay aunts (and an imprisoned aunt and a mentally challenged aunt actually.) and many gay friends! I want him to learn to accept all and love all. Some people think this is against God, but I feel like it is showing examples of God’s love and how to be more like Him. I did see a protest like this once…. at a Lady Gaga concert. LOL. Of all of the things I thought people would tell me that I’m going to Hell for I didn’t think going to a concert was one of them. People are silly. Ignore the haters. They really do live a very miserable life. A Lady Gaga protest? I laughed when I read that, because I think you make a great point about how it seems as though some people just protest for the sake of protesting! Also, I just wrote a bit about my religious believes in response to Katy’s comment above – which you might find interesting. While I am personally very conflicted/confused in my religious believes (which I readily admit), I know that I can only wrap my head around a God that you described – a god that “loves EVERYONE and wants us to love everyone”. I’ve seen a lone protestor or two here and there in Toronto but they are always booed and run off by the thousands upon thousands of supporters. It’s hard to imagine why some people are so anti-gay…what are they afraid of, exactly? I think it’s great you went to Pride! It could be a fun family tradition for you guys. I used to go a lot more often when I was younger but now that I’m a mom, I haven’t gone at all! I probably should – Toronto does a family pride area and it’s super popular. I just hate crowds, lol. Actually, I didn’t write about all the positivity that the protesters were met with by the pride participants and the spectators. 🙂 It warmed my heart as the positivity was definitely louder then the negativity. I must take my crew to a Pride event. I am inspired to do so many things by you! I think it’s awesome that your family went to Pride. It’s people bringing their kids to things like this that is going to help create more acceptance of our amazing LGQTB (that might be in the wrong order?). I think if kids are shown that their parents are accepting of other’s lifestyles then they will also learn that there is absolutely nothing wrong with a man loving a man, etc. And that will be something they will bring to school with them, help teach their friends, and soon we hopefully will live in a world where there is complete acceptance. Great job mama MPB! We have a lot of friends who are gay and our new favourite neighbours are gay and we know that it will be a world H will know a lot about and not even care at all if someone is gay or straight. To him, it will all be equal. It always baffles me that the same things that are the cornerstone of so many religions have adherents that are defying those ideals. I love that you are exposing Little MPB to all kinds of things and ultimately letting him make his decision on what he supports. Love, kindness, compassion, and acceptance is awesome! I’ve been going to Pride for fifteen years and every year there is a protest of some sort. It’s usually the religious fanatics who aren’t interpreting religion how I do who are being the most hateful. I love seeing kids and families at pride. It warms my heart knowing the younger folks will have it so much easier! If people could just understand that they can disagree with people’s choices/thoughts/lifestyle, without having to show disgust or hate towards them. That’s not right! That’s not what Jesus would do. DH and I both have gay family members and it would break my heart for them to be treated unfairly (I’m sure they have been). I love them like I love everyone else in our families. They deserve to be treated the same and loved the same. To be treated with dignity and given respect. This is why I don’t consider myself “religious”, but a Christian. I want to show people, all people, the love Jesus has for them. Not yell at them and cause them sadness. That’s not true religion. What a wonderful event to take little MPB to experience!! I am not a religious person, I do very much dislike when people use religion as an excuse for their own bigotry and hate. It’s so awful. Most of the main religions promote love and acceptance. It is just so wrong when people appropriate religion for their own hateful means. It casts a bad light on religion and the people who do practice the love and acceptance parts of it. I used to go to the one in NYC when I lived in CT. Every last Sunday of June, I’m a little sad I’m not there with my best friend. There’s always protesters at that one too.